Developer: Nintendo EPD; Platinum Games. Stubborn is perhaps the kindest way to describe Star Fox Zero. Many Nintendo fans have been clamouring for a “true” Star Fox game, as sequels such as Adventure and Command have often removed the space-combat of the lauded Star Fox 64. Now, with assistance from Platinum Games, we’re getting Zero, a quasi-reimagining that mixes a lot of familiar elements with Wii U Gamepad gimmicks. Unfortunately, it doesn’t pan out, causing SFZ to crash and burn. Star Fox Zero follows the premise of older games quite closely. You once again enter the cockpit as the titular protagonist, along with his comrades Slippy, Peppy and Falco. As the Lylat system is once again under threat from invasion, it’s up to Team Fox to repel the invasion and save Corneria. Along the way, Fox may also seek closure around the passing of his father and face a series foe once more. It’s overly familiar, but at the same time, it’s still enjoyable, especially for fans of the series. The voice acting remains a bit goofy, but likably so with oddball lines and strange deliveries that make you chuckle rather than cringe. This familiarity also extends to the gameplay. As with SF64, you progress through multiple planets completing a series of missions, ranging from shorter ones to those lasting around twenty minutes. Each stage contains collectible medals, hit challenges and, in some cases, hidden stages which test your skills to the limit, eclipsing the main game’s difficulty by a significant degree. While you could feasibly finish SFZ in four hours, there’s good incentive to replay these stages to find all the secrets which may have been unattainable on your first go. An arcade mode also unlocks which tasks you with completing the game with minimal lives, much like the coin-ops. That being said, it’s still short on value, as you’d be lucky to spend much more than ten hours on it. Unfortunately, things fall apart once you enter the cockpit. Zero prides itself on how it integrates the GamePad into the gameplay, but this ultimately compromises things. You see, you’ll be piloting the Arwing through both your TV and the GamePad screen, as aiming is done by tilting the gamepad. The learning curve is quite steep, but although it is something you can overcome, the flying never feels particularly smooth. Your reticule often becomes scattershot, forcing you to reposition it multiple times. The camera struggles to keep up during boss fights, which automatically lock-on to focal points. Though it can be fun once you figure it out, it sadly feels like a forced gimmick. And that’s just the Arwing, because unfortunately, other vehicular elements are worse. The Walker from the cancelled Star Fox 2 makes an appearance here, allowing you to navigate tighter passages and fight on the ground. This lacks the fluid movement required for precision, causing these segments to be somewhat frustrating. The Landmaster is not much better, a full-tank mode which controls poorly. The final element, the Gyrowing, fully relies on motion control and using the second-screen to guide both a mini-heli and a robot, but controlling these makes you want to pull your hair out, hindered by awful camera and unresponsive controls. These tacked-on elements water down the space combat, and feel like tacked on elements attempting to promote the GamePad but failing to do so. It’s a shame, because some of SFZ’s levels and setpieces are fun. The bosses are pretty consistent, with Platinum’s penchant for scale and challenge shining through here. Bosses often occupy the entire screen, and require some crazy techniques to take down. Unfortunately, the learning curve can often prove frustrating, mainly due to a lack of checkpoints and some cheap moments. Though you can earn lives through gold rings, if you lose all said lives you must begin the whole mission again. While some missions are so short it isn’t too much of an issue, those levels with multiple bosses and challenging segments can become rather tedious. 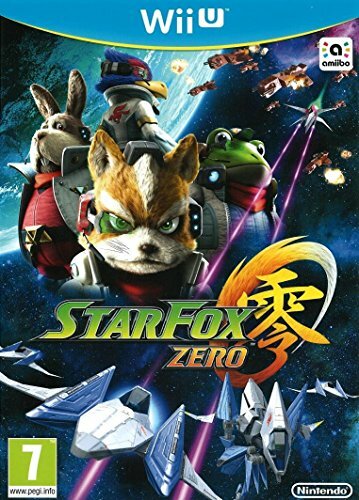 Star Fox Zero at least benefits from decent production. The visuals look pretty good, with colourful reimagings of classic levels such as Corneria, which looks gorgeous on eighth-gen hardware. It does admittedly reuse a lot of enemies from older games, but they’ve been nicely updated for Wii U. However, the game struggles to maintain 60fps, sometimes dipping noticeably below it. The music and acting feels spot-on, recalling older games while updating them to modern standards, and the sound effects are good too, heightening the intensity of space combat. It’s a shame Star Fox Zero is so insistent on utilising Wii U GamePad gimmicks, as they often come at the detriment of the overall game. SFZ manages to capture many of the best parts of the older games – particularly Star Fox 64 – and often delivers these with a nice, new layer of polish. But unfortunately, these elements are buried under control issues, a frustrating learning curve that often descends into trial-and-error, and a lack of checkpoints. It may still appeal to avid fans of the Fox Squad who have been craving a space-shooter, but otherwise, the wait will continue for a big, new Star Fox to emulate the series more iconic games. "It may still appeal to avid fans of the Fox Squad who have been craving a space-shooter, but otherwise, the wait will continue for a big, new Star Fox to emulate the series more iconic games."